Light pink Hybrid Tea. Bred by Rev. Joseph Hardwick Pemberton (United Kingdom, 1926). Light pink. Moderate fragrance. Large, double (17-25 petals), globular, high-centered bloom form. Blooms in flushes throughout the season. Dense, upright. Light green foliage. The account of the Rev Pemberton below is copied verbatim from wikipedia, Oct 2017. The Reverend Joseph Hardwick Pemberton was born in 1852 in The Round House, Havering-atte-Bower, Romford, Essex; he lived there with his sister Florence until his death in 1926. He was an Anglican clergyman for more than 30 years. A keen amateur rose grower, he joined the Royal National Rose Society shortly after its founding, and in 1911 served as its president. 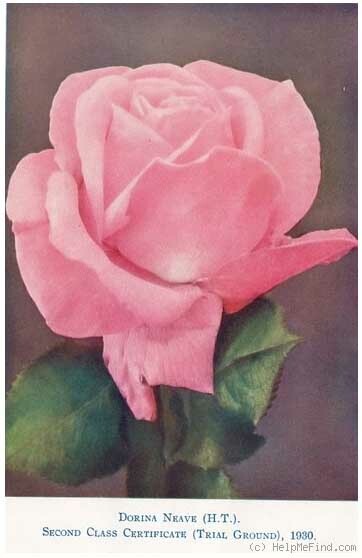 After his retirement in 1914, Pemberton turned to rose breeding in an attempt to recreate the "Grandmother's roses" he recalled from childhood. He set up Pemberton Nursery at Romford and nearby where eventually some 35–40,000 roses were grown annually for sale. All the roses of the Pemberton Nursery were bequeathed to their gardeners, who at Romford were Jack and Ann Bentall. They released several new roses after Pemberton's death.